It was always going to be difficult to re-create the magical relationship between Harry H Corbett and Wilfrid Bramble as rag and bone men in the iconic sitcom Steptoe and Son. The father and son double act was perhaps one of the finest comic performances of recent times, bringing humour into a world of grime and hardship during its screening in the 60s and 70s. It was Corbett and Bramble’s on-screen chemistry as much as Ray Galton and Alan Simpson’s scripts which made this such a success and so it was intriguing to see how adapting the show for the stage was going to work. Emma Rice has picked four episodes from the original series for this Kneehigh and West Yorkshire Playhouse production – and has thrown a woman into this testosterone-fuelled environment for good measure. Initially it was hard to adjust to this new Steptoe and Son. Mike Shepherd as the “dirty old man” and Dean Nolan as Harold had off-putting West Country accents rather than the familiar cockney lilt and it was not until a more emotional second half that you really begin to warm to their characters. 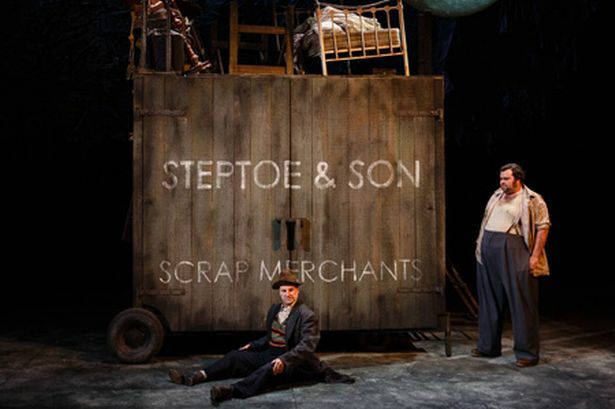 The stage is dominated by a giant rag and bone cart, enclosed with double doors, which are opened to reveal the pair’s rather pokey and grimy abode. The woman, played by Kirsty Woodward, is often seen floating in between scenes, sometimes as an observer but at other times playing the potential love interest of Harold and his father, serving as a cruel reminder of how their lives could have been so different. Rice also throws in plenty of music in between scenes to reflect the changing era, prompting some interesting dancing moves, with Nolan often providing the most comedy. A warm performance all round, offering a few comedic and also tender moments. Just try and leave the memory of Corbett and Bramble at home.